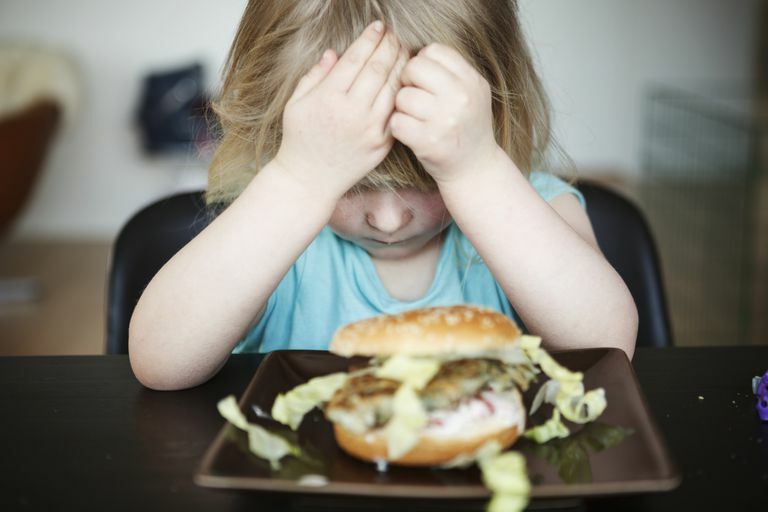 Children who have a hard time with eating, who complain of food getting stuck in their throats and who refuse to eat, may have a chronic condition called eosinophilic esophagitis (EoE). Eosinophilic esophagitis is part food allergy, part swallowing disorder, and can cause children to grow poorly and to be agitated at the meal table. In adults, EoE can cause difficulty swallowing and symptoms that are similar to heartburn. Eosinophilic esophagitis had been considered to be rare, but awareness and diagnoses are increasing. Here's a primer on the condition, its diagnosis, and treatment. EoE is a chronic immune system condition, only recently identified by the medical community. Rates of diagnosis have been increasing over the last 10 years, similar to the increasing rates of allergy and asthma diagnoses. The condition is named for eosinophils, a type of white blood cell, and for your esophagus, the tube that connects your throat and your stomach. The esophagus is also called the gullet. Eosinophils are white blood cells normally found in your digestive tract. In people who have EoE, these white blood cells build up in the esophagus. The eosinophils produce a protein, which causes swelling or inflammation. This can lead to scarring and narrowing of the esophagus over time and the formation of fibrous tissue in the lining of the esophagus. Eosinophils build up in the esophagus because the body is reacting to a food allergen or other allergens such as pollen. In some people, they may build up in the esophagus because of acid reflux. About 50% of people with EoE also have seasonal allergies or asthma. Regardless of the reason for the buildup, the damage to the esophagus makes it difficult for the person with the condition to swallow, or may lead to a feeling of food getting stuck. Children and adults may experience the symptoms associated with EoE differently. Gender: EoE is more common in males than females. Genetics: EoE seems to be genetically related; if a family member has EoE, the risk is higher for developing EoE. Allergies and asthma: Those individuals with food allergies, other allergies, and asthma are at a higher risk for developing EoE. Where you live: Living in a cold or dry climate increases your risk for EoE. Season of the year: Individuals are more likely diagnosed between spring and fall when environmental allergens are higher and people are outdoors more often. Several tests are performed to diagnose EoE and including upper endoscopy and biopsy. Upper endoscopy uses a long narrow tube with a camera on the end inserted through the mouth and down your esophagus. This procedure allows the doctor to view your esophagus and look for inflammation and swelling, or any other abnormalities associated with EoE. A biopsy involves taking a sample of your esophageal tissue from several locations (usually two to four). If you are suspected to have EoE, your doctor may perform additional tests such as blood tests, medication trials, a food patch test, and diet modifications. There are 10 to 15 common foods that cause EoE, but the body can react to any food. Trigger foods must be removed from the diet on a long-term basis in order for symptoms to resolve. The irony of EoE is that your body may be reacting to a food you eat everyday—one that doesn’t appear to be problematic for you. Some of the most common foods allergens that trigger EoE are dairy, wheat, egg, and soy. If a food or more than one food is causing your symptoms, those foods will be eliminated from your diet. Some cases of EoE require extensive dietary modifications. An elimination diet may be part of the treatment plan. In other cases, special formulas called elemental diets are used to eradicate all food sources of protein while covering an individual’s nutritional requirements, especially if multiple foods need to be removed from the diet. Several medications may be used in the treatment of EoE. Typically, an acid blocker is tried first, but some people may not show symptom improvement. A topical steroid given as a puff or mixed into a slurry may be used. This can help relieve swelling in some individuals without the side effects associated with steroids because it isn’t absorbed into the bloodstream. If these medications don’t work, steroids, such as prednisone, may be prescribed. Steroids may decrease the build-up of eosinophils and allow your throat to heal. Some individuals may be on steroids on an ongoing basis. In those who experience narrowing of the esophagus (called strictures), a procedure called dilation may be recommended. This procedure widens the esophagus and makes swallowing easier. However, there are risks of esophageal tearing and perforation. Dilation does not address the underlying inflammation. Managing EoE can be tricky, and likely will involve major dietary changes. You'll need to work with your allergist to determine the most likely dietary culprits, and then eliminate those from your diet. This can take time, and may be disruptive, since the foods most likely to be involved—dairy, wheat, egg, and soy—also are extremely common in the food supply. If you find you're struggling with diet, ask your doctor if she can refer you to a dietitian who's skilled in helping people with serious food allergies. Furuta et al. Eosinophilic Esophagitis in Children and Adults: A Systematic Review and Consensus Recommendations for Diagnosis and Treatment. Gastroenterology. 2007. 133: 1342-1363. Liacouras CA. Eosinophilic esophagitis: Updated consensus recommendations for children and adults. The Journal of Allergy and Clinical Immunology. 2011; 128: 3-20. American Academy of Allergy, Asthma, and Immunology. Eosinophilic Esophagitis fact sheet.